Dropbox, Evernote, MobileMe: The Internet is loaded with cloud-based services designed to make your life easier and keep your files within reach where ever you go. Finding the right services with just the features you need can be a daunting task, so Jeff took care of the headache for you by putting together a list of his favorite online services and apps for your Mac, iPhone, iPod touch and iPad. I’m speaking from noon to 1PM and I promise to do my best to teach you something — or at least keep you entertained for an hour. But wait! There’s more! I’ll be speaking on the opening panel event at 9AM where the amazing Adam Christianson from the Maccast will guide us through a discussion on the future of Apple and the impact the company’s products are having on out culture. Talk about a power house lineup! The panel also includes The Mac Observer’s own Bryan Chaffin, Smile Software’s Jean MacDonald, Jason Snell from Macworld, and David Sparks from Mac Power Users. 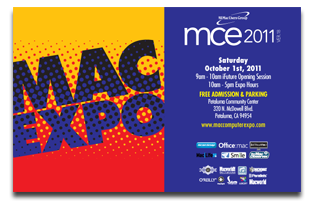 Bryan and I will be manning TMO’s expo booth, too, so be sure to drop by and say “hi.” Maybe I’ll draw a picture for you. This entry was posted in Apple, Events by jeff. Bookmark the permalink.